Hang Seng Management College has conducted the Junzi Corporation Survey every year since 2011. This year’s survey is the seventh study of the series. Conducted in the most objective and scientific fashion through a rigorous research procedure over the years, this widely representative academic survey has always attracted the attention of the industry. The survey is aimed at promoting a new academic viewpoint that adopts “Junzi’s Five Virtues” as a code of ethics for operation and awarding accolades to corporations with demeanour typifying Junzi. The Junzi Corporation Survey this year is a quantitative study conducted through a questionnaire, an approach constantly used in the past six years. 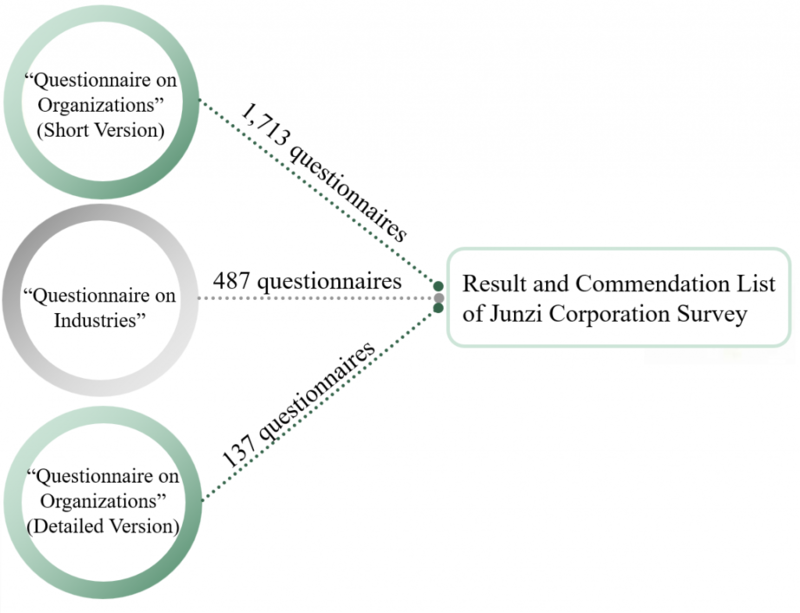 The design of the questionnaire was modified by the research team based on the previous questionnaires and the model of Junzi Corporations. After years of testing, the questionnaire has demonstrated a high level of validity. The method of data collection followed the approach of last year. The public’s evaluation of different organizations’ performance in business ethics was investigated in a progressive manner. Due to the large number of organizations, the research team did not evaluate all of them based on the Five Virtues, namely Benevolence, Righteousness, Propriety, Wisdom and Sincerity. The data collection this year finished during July and September. The survey teams randomly selected 31 locations across Hong Kong Island, Kowloon and the New Territories from the District Council Constituencies, which covered the entire Hong Kong. The investigation was coordinated by Research Institute of Business (RIB), Marketing Department, and Marketing Society of Hang Seng Management College, face-to-face street interviews were conducted. In the entire survey period, the survey teams collected 2,337 public responses in total. The survey teams, comprised of 59 students from Hang Seng Management College, carried out all the field work. All survey team members had to satisfactorily complete training before being sent to the fields. The survey was conducted in the form of interview because it could effectively help build mutual trust between the interviewers and interviewees. In addition, it allowed the interviewers to effectively explain to the interviewees the abstract concepts embedded in the questionnaire (for example, Junzi, Benevolence, Righteousness, Propriety, Wisdom, Sincerity). We, therefore, believed that we could collect data of relatively high quality through interviews. Every team was assigned a leader, who was a student experienced in conducting survey. In the meantime, we set up a monitoring system. The research team and inspectors from time to time made spot checks in randomly selected areas to ensure the reliability of data. Like last year, we adopted a two-stage sampling method. First of all, the survey teams randomly selected various places across Hong Kong Island, Kowloon and the New Territories from the 2015 District Council Constituencies, which covered the entire Hong Kong. After that, face-to-face street interviews were conducted through quota sampling according to age and gender. Like the previous surveys, the Junzi Corporation Survey this year took constituencies as the sampling frame. This enhanced the representativeness of the samples as they were taken randomly from citizens from different age groups in various constituency areas. As the aim of this survey is to identify “Junzi Corporations” in the eyes of consumers, the seven surveyed industries in the study are deeply associated with the lives of the general public. These industries are wholesale and retail, postal services and transportation, tourism, finance and insurance, accommodation and catering, information and communications and real estate. Unlike in previous years, the names of the seven industries and the classifications of corporations are determined according to the Hong Kong Standard Industrial Classification Version 2.0 from the Census and Statistics Department. This classification closely matches the current industry information in Hong Kong so that the corporations in various industries can receive comments from the public. Moreover, as the public generally have knowledge of the corporations in these industries, they are able to assess the performance and business practices of these corporations.